Cosplay Interview with Alhon « Adafruit Industries – Makers, hackers, artists, designers and engineers! Alhon, a.k.a. Eric Olp, caught my attention with his Kylo Ren costume. The combo of the costume featuring the villain from The Force Awakens and the snowy setting led me to his Facebook page where I found a variety of costumes including Handsome Jack, Darth Revan, Kanan Jarrus, and more. I asked him about his cosplay history, making the Ren costume, and more. Alhon: I’ve been cosplaying since about 2011. It honestly started as a joke between friends that I actually made good on. Back in the day we used to play a LOT of League of Legends (this is when the game was still in beta and before it exploded in popularity), and we were all supposed to cosplay the characters that we played in the game. For most of my friends, that meant simple dresses or simple props, but my best character was the pink gem knight Taric. I’m pretty sure my friends didn’t expect me to make that, both because of the armor and how intentionally ridiculous he looked. What started as a joke turned into a major hobby as a few months later I was walking through a convention center with a four foot tall massive spiked hammer and a pink suit of armor. Adafruit: How many costumes have you made so far and which one has been the most challenging? Alhon: I’ve done about 12 to 13 costumes so far. Some of them have been really simple, some really elaborate, and one of them I sewed and built literally the night before a convention. Which isn’t usually too bad, but it’s not often one starts a project at 1:30 AM. I am not known for being sane. The most challenging would have to be one I did this past summer, building Hyrule Warriors Link. With it, not only did I have the usual undershirt, pants, and tunic to build, but I also did about 100 hours of hand embroidery and worked with worbla for the first time on it. It was a massive project for me, as I had never done embroidery ever before. Adafruit: Have you had to learn any new skills because of cosplay? Alhon: Every single project! Sewing, crafting and cosplay are not skills that come naturally to me, at all. It was the other reason I chose to pick it up. Normally I’m a software developer and engineer, a very tech-y person, and being able to have a hobby that forced me away from my computer was a wonderful thing. I’ve learned everything from the most basic of sewing and painting all the way up to building full and strong props and armor pieces. Every single project I undertake has some kind of extra challenge to it, something I’ve not done before or something I’ve never tried. 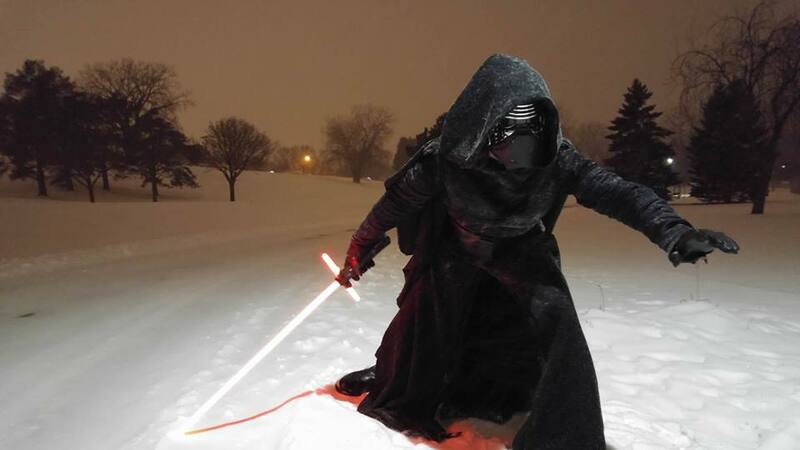 Adafruit: The photos of your Kylo Ren cosplay in the snow turned how so well. How long have you been working on the costume? How did you replicate the pleated sleeves? Alhon: Kylo was a seriously fun project. I didn’t have a lot of time to have him ready, as I was working on my previous project (Kanan Jarrus from Star Wars: Rebels) up until the first weekend of November, so that I could have him done in time for a photoshoot. So effectively, Kylo came together in 6 weeks. The arm pleating was tricky. My “new thing” on this project was pleating at all. Totally new concept to me. 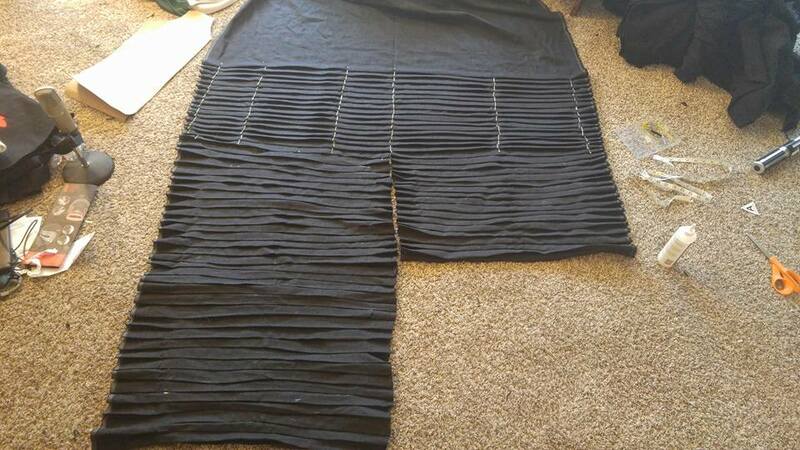 Each pleat I did by hand, measuring out the space between each pleat, pinning it down across the fabric, and then moving it up to the next one. For one of the sleeves, I tried to sew each pleat into place, but I didn’t quite do it right (although I know now what I should have been doing to fix that. Something to remember for the future), so when that experiment didn’t turn out as I had hoped, the other sleeve ended up getting simply glued together with fabric glue. Not something I recommend or am thrilled with, but when every project you learn something new, it’s a risk of the job. Adafruit: What costumes are next on your list? 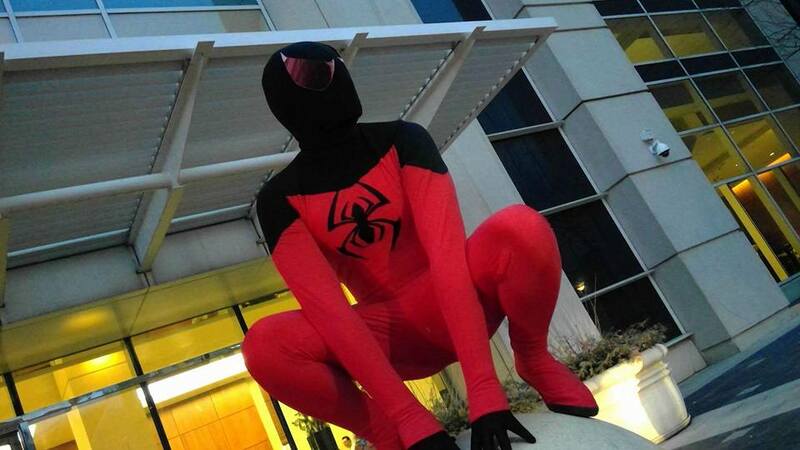 Alhon: My next project is Marvel’s Scarlet Spider (The second one, Kaine, not the original Ben Reilly one). The new one on that is working with spandex, as it’s a material I’ve used only sparingly, and has given me trouble. I also love the character to death, and wanted to try to do him justice. Beyond that, I have a HUGE project that I’ll be working on through spring and summer, and that is Jet Bradley from the mid-2000’s PC game Tron 2.0. I’m tweaking his design in the colors slightly to give him more of a “Tron: Legacy” vibe, but it’ll be my first time working with electronics in a cosplay, as I’m intending to making all of his glowing panels actually glow. Keep up with Alhon’s upcoming projects and view everything he’s done by liking his page on Facebook.